There they were. 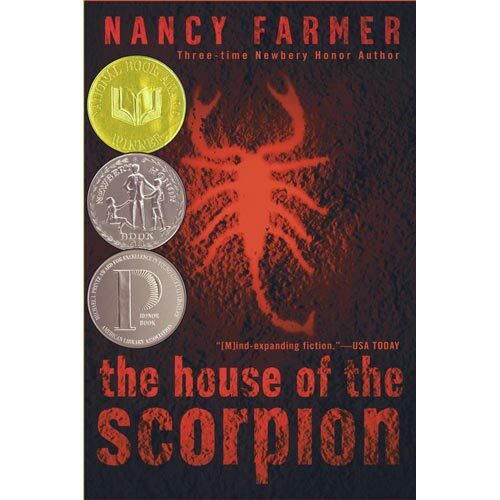 Four used copies of Nancy Farmer’s The House of the Scorpion, and they were my find of the day at the Friends of the Danbury Public Library Fall Book Sale last weekend in Danbury, Connecticut. The unmistakeable bright red-orange and black spines were scattered in the author-alphabetized “F” section of the fiction offerings. They should have been in the young adult (YA) section, but a volunteer’s shelving error was probably why they were still available when I arrived. In this case, chance favored me. The genre of science fiction is amazingly prescient in predicting technological advances. H. G. Wells’ offered The First Men in the Moon in 1901, 68 years before Neil Armstrong exited Apollo 11 and took steps on the lunar surface. Digital books, submarines, droids and robots were features in science fiction novels before they became real nouns in our vocabulary. Credit for dreaming up the Internet is given to a wide spectrum of fiction writers, from Mark Twain to Arthur C. Clarke, and manipulating human life has its genesis with 18 year old Mary Shelley’s Frankenstein. Therefore, Farmer is following the successful literary tradition of predicting man’s future. Her prediction takes the form of another dystopia, the equivalent of a political science crash course in failed nation-states for young readers. In addition, Farmer’s predictions of a territory between the United States and Mexico controlled by drug cartels is plausible. That is the setting for her “coming of age” story of a young clone named Matt. The medical breakthroughs that create Matt, a clone of the drug lord El Patrón, are also feasible. Matt is unaware that his life is both protected by his status as the clone for the most powerful man in the land of Opium and endangered by El Patrón’s mortality…and at 146 years old, El Patrón is very mortal. Farmer combines the issues of organ-harvesting, the economics of drug use, and adds a few Zombies for an exciting read that contains several amazing plot twists. I remember my jaw dropping…I didn’t see one twist coming at all. Farmer’s inventiveness with plot and skills as a storyteller resulted in the book receiving both a National Book Award for Young Adult Literature and a Newbery Honor in 2002. Last year, we offered 7th grade independent choices in literature circles centered on their interest in dystopias. The House of the Scorpion was one title offered along with other science fiction novels including Orson Scott Card’s Ender’s Game, M.T. Anderson’s Feed, Neil Shusterman’s Unwind, and several of Scott Westerfield’s selections from his Pretties series. Students fresh from reading Suzanne Collins’s The Hunger Game Trilogy were ready for other predictions for the future, and those who had not completed the series were given the opportunity to read these as well. The cost for the four gently used copies at the book sale was $8.00; copies normally retail for $8.10, so this was a “buy one get three free” bargain in comparison. Based on other used book sales, we now have a class set (30) of The House of the Scorpion. The novel could be an all class read, however, as some of the topics in the novel require mature readers, we opt to make this and the novel Feed independent choice books. The ethical questions raised in Frankenstein and The House of the Scorpion makes them good companion pieces, but that is not the only reason to pair them together. Our English Department’s essential question is “What does it mean to be human?” Literature gives students the language and the models for answering that question. The Monster in Frankenstein and the protagonist Matt in The House of the Scorpion are “non-human” characters that make students consider that being human may not be limited by the definitions in science, but by the possibilities in science fiction. If there is a core text for middle school students, then Lois Lowry’s The Giver is high up on the list; our students read The Giver in Grade 7. This novel follows Jonas, who receives his life assignment at the age of 12 as the community’s “memory keeper”, a position that requires him to accept serious responsibilities. Jonas is able to experience a wide range of emotions that his community has suppressed in others; he feels joy, despair, terror and can see colors that others cannot. Jonas escapes the community in order to save the life of his baby “brother” Gabriel, and the last pages of the novel find the pair in the snow facing an uncertain future. Lowry confronts the reader with uncomfortable situations, and many middle school students do not enjoy the book, but they do remember the book. I can use references to Jonas and his community throughout high school, and students will make connections to The Giver in their responses to literature. There are always used copies of The Giver in the children’s sections at book sales. I have never found the book mistakenly shelved with adult books; apparently, everyone is familiar enough with the book to know where to place a copy. These copies are usually pretty worn- some have highlighted text, others show “backpack” abuse. I will purchase most of these copies so that we have extra copies for students to write in or maybe create “found poetry” with pages from a disassembled text. Occasionally, I will come across a newer copy to add. Since children’s books are generally $.50 or half the cost of an adult trade paperback, I am not overspending when I get these copies. The cover has not changed since the book’s first printing, except to add the Newberry Award medallion to the upper right corner. The old man’s face and torn left corner are evocative of the novel’s themes. Here is a cover students can write about! The novel’s size is a mixed blessing- small enough not to intimidate the reader, but also small enough to be lost in a pile of used books. I often have to dig into piles of children’s books to find a copy. Currently the book retails for $6.99. The Giver will remain as a core text for our 7th graders. This is one of the books Wamogo middle school students who have come from three different elementary schools from three different towns will share together. Lowry’s novel marks a similar “coming of age”; as 7th graders, our students also have new responsibilities. Many of our students feel at times that middle school is a dystopia (a police state? ), and they share these connections and their ideas of their future when they read this text. Many students may not enjoy the book, but all students keep memories of The Giver.